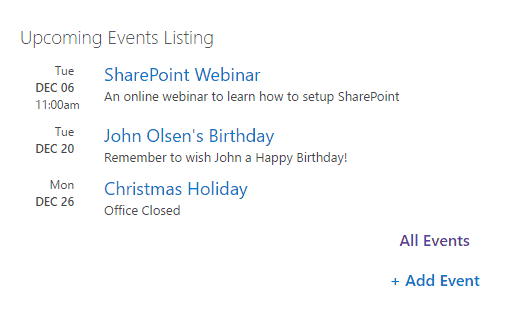 This Add-in for SharePoint and SharePoint Online lists upcoming events from a configurable SharePoint calendar. This Add-in for SharePoint 2013 online allows a user to add a new Add-in Part which will list upcoming events from a configurable SharePoint calendar. Organizations typically use this to list Company Events on their internal Intranet pages. The Add-in Part can be added to any page on a SharePoint site.